"I am a Real Food advocate. I am a dancer. I am a Pinterest addict. I am eager to heal myself and others through holistic nutrition." We definitely have a few things in common Lauren! Lauren has only recently started her blog but already it's proving to be a great resource for followers of gluten-free, Specific Carbohydrate and GAPS diets and anyone who is interested in wholesome food and holistic nutrition. Thank you so much for the award Lauren, so very, very sweet of you! 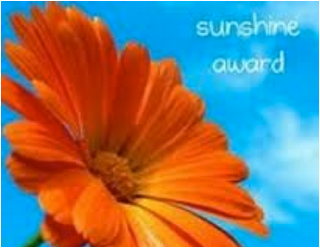 "The Sunshine Award is an award given by bloggers to other bloggers. The recipients of the Sunshine Award are: “Bloggers who positively and creatively inspire others in the blogosphere.” The way the award works is this: Thank the person who gave you the award and link back to them. Answer 10 questions about yourself. Select 10 of your favorite bloggers, link their blogs to your post and let them know they have been awarded the Sunshine Award!" 2. Favourite Animal: all, except perhaps crocodiles, but I love my cat Tilly the most. 3. Favourite Number: it used to be 7 but I haven't thought about it much recently. 4. Favourite Drink: at the moment it's raspberry and apple juice though I still enjoy a coffee. 6. Good Movie or Good Book: movie, there's nothing we like better than to curl up on the sofa and watch a good movie. My favourite is "Notting Hill". 7. My passion: this is simple - my family but they may say it's my blog now! 9. Favourite Day of the Year: Christmas Day especially when we're all together. 10. Favourite Flower: daffodils, they symbolise the beginning of Spring and warmer weather to come and they're so pretty! Laura of Gluten Free Pantry - Laura is such a sweetheart! A wonderful gluten-free cook, Laura has studied nutrition and holistic medicine for many years and we both have an interest in the huge benefits to be gained from cooking and healing with herbs and spices. Her creative cooking skills make this site a fantastic resource for anyone following a gluten free diet. Ella of Lifeologia - what can I say about this very special person...an inspiration to all of us and her beautiful spirit shines through in her amazing photographs and her love for life. Please visit her site, you won't regret it! Richa of Hobby and More - Richa is such an inspiration, her creative and tasty vegan food is to die for and she often posts recipes which are also gluten free. She regularly posts new recipes and never seems to run out of ideas and since I am a huge fan of Indian food, I adore her food blog. Richa is also passionate about animals, raises awareness of animal cruelty and supports animal sanctuaries and rescues. Keep up the great work Richa! Alea of Premeditated Leftovers - Alea has been such an amazing support for me since I started my blog and her website is full to the brim with recipes and amazing tips. Alea has a keen sense of humour and quite often her facebook posts have me rolling on the floor in stitches! Valerie of City Life Eats - Valerie's blog was also one of the first I discovered about the time she was writing her fascinating lunchbox posts. Valerie has found time in her very busy schedule to share the most amazing recipes and articles about her other passions in life. Thank you for inspiring me Valerie! April of The 21st Century Housewife - April has also been a huge support over the past year and she's such a sweet natured person. I'm fascinated by the cakes she creates and she has a huge love for fashion. April also writes tips and advice on travel. Thank you for spreading the love April! Raj and Sonia of Flip Cook Book - Raj and Sonia are authors of one of the first SCD websites I discovered and I have fallen in love with their creative vegetarian and gluten-free food. I feel I have known both of them for years now, and I love their Sunday recipe carnival, Sugar Free Sunday, you must visit it! Kalinda of Wheat Free Meat Free - Kalinda (and Mike) shares a selection of gluten-free, vegetarian recipes each week and she is particularly special because she isn't a vegetarian nor does she have to follow a gluten-free diet she does all of this for Mike who has Celiac Disease. This is another site which I found when I first started my blog and one which I've loved to regularly visit. Thank you for your dedication Kalinda! Jadah of Relish SCD - Jadah posts recipes suitable for the SCD and gluten free diets and she also updates about her progress and writes reviews on SCD legal food and related topics. I am so pleased that she has made progress on the diet this most definitely will inspire others to continue, good luck for the future Jadah! and finally last but certainly not least, Shirley of GFE Gluten Free Easily - Shirley has probably received hundreds of these awards but I'm nominating her today because she fits the description of the award 100 per cent and I adore her informative blog and the incredibly interesting articles she writes, not forgetting the awesome recipes there! Shirley works tirelessly for the gluten free community both at home and on-line and her Virtual Gluten-Free Support Group is an amazing resource for all! I hope you will go and visit at least some of these blogs!